COTA has a nursery certified for quality and traceability, which is controlled by official institutions (SENASA, INASE). This nursery comprises 7.300 sqm modules of covered surface, which allows for 30,000 lemon trees each year, destined to our fields and our associates. 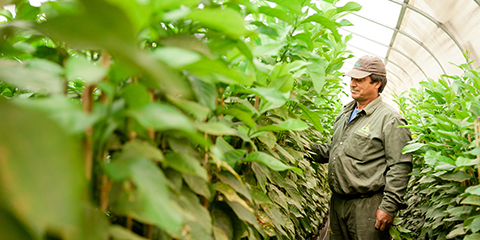 Our cooperative policy encourages maintenance and replanting of our fields for future growth. The nursery is the first step in the plants’ loop, as they remain here for a period of 18-24 months. The process begins with the sowing of certified seeds, and it is followed by ringing, grafting, tutoring and finally rustification of the plant ready for its life in productive fields. All this steps take place in covered areas which are controlled by cupric fungicides and residue-free pesticides, to guarantee the appropriate health and nutritional characteristics. Genova, Lisbon, Eureka and Limoneira are some of the varieties we work with at COTA.